High quality aluminum alloy body, sturdy, durable and lightweight. Unique trigger-action design, easy to manipulate. Turn the on-off switch on the handle, object can be kept being held or released. 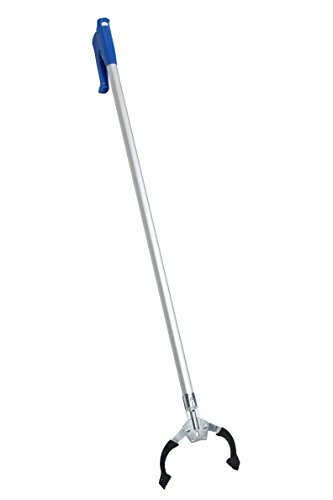 Versatile reacher for picking up objects without bending or straining, around the home, in the garden or when out and about. Rubber grabber jaw to provide maximum grip strength, allowing you to pick up items of all shapes and sizes with ease and prevents them from slipping. This versatile reaching aid is designed for picking up small or lightweight objects around the home, in the garden. Can pick up post, papers, keys, remote control, litter, leaves. Useful for a person who has difficulty or finds it uncomfortable to bend or stretch when reaching. Including those who use a wheelchair or who have mobility difficulties and those who suffer from back or hip pain. High quality durable aluminum material promotes prolonged reliable use for those with limited reach. Ergonomically designed pistol trigger and handle are easy to use and provide maximum comfort. Plastic handle and jaw with aluminum metal body structure are durable and lightweight. Turn the on-off switch on the handle, object can be kept being held or released. Length: 96cm(37.8 inch), Jaw length: 12cm(4.7 inch). This long grabber provides maximum added reach without compromising on comfort or effectiveness. Pick-up items from the top shelf, floor, lawn or under furniture. Save your back and avoid a stepping stool, this reach extender is ideal for the elderly that do not have the strength to get up or bend over, and for people with disabilities. If you have any questions about this product by VOIMAKAS, contact us by completing and submitting the form below. If you are looking for a specif part number, please include it with your message.